Fantails, also called wagtail flycatchers, are a component of the large Australo-Papuan songbird group, the so-called "corvine radiation." They are closest to the drongos of the Dicruridae family and monarch flycatchers of the Monarchi-nae family. The fantails are either classified in their own family or as a subfamily of the monarch flycatchers, or in a broader drongo-monarch grouping. There is no doubt that they represent a distinctive group of insectivorous birds. Generally the 40 or more species are referred to the single genus Rhipidura, although the yellow-breasted fantail (R. hypoxantha) is sometimes placed in the monotypic genus Chelidorhynx. Within the genus Rhipidura, there are several distinct subgroups. The largest of the fantails, the willie wagtail (R. leucophrys), is perhaps the most atypical member of the genus. It spends much more time on the ground than other species. The northern fantail (R. ruftventris) is one of several more sedate species; although capturing prey in flight, these do so without the aerial flourishes of most fantails. The thicket-fantails, like the sooty thicket-fantail (R. threnothorax), are shy and secretive inhabitants of dense rainforest understory. The remaining species of fantail, however, are active and conspicuous. These are distributed across the family's range. 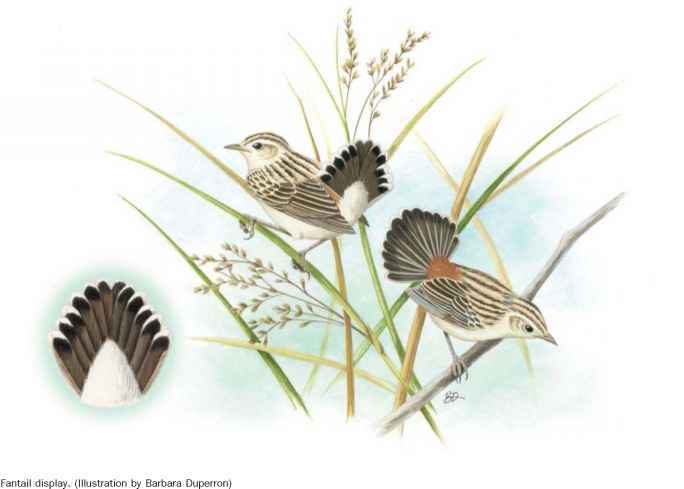 The gray fantail (R. albiscapa), streaked fantail (R. spilodera), and rufous fantail (R.
rufifrons) species-groups each include a number of species spread across substantial parts of Indonesia, Australasia and the southwestern Pacific. Other species have less obvious connections with other fantails. The tiny yellow-bellied fantail has a unique color pattern and other minor differences, and the blue-headed fantail (R. cyaniceps) and blue fantail (R. su-perciliosa) are also unusual in their color; otherwise these are fairly typical members of this family. numerous subspecies in widespread species; the northern fan-tail, for example, has 24 named forms scattered across the Bismarck Archipelago, northern Australia, New Guinea, and islands of the Moluccas and Lesser Sundas. On occasion, the two small flycatchers in the genus Culi-capa have been associated with the fantails. Although the proper taxonomic placement of these south and southeast Asian species is uncertain, it does not appear to belong to the genus Rhipidura.